A range of robust and compact fan heaters for professionals with high demands. The 3kW fan heater is portable, can also be hung on the wall and is intended for heating and drying areas such as garages, workshops and shops. Comfort: These fan heaters are extremely quiet and quickly provide comfortable heating. With a portable fan heater it is easy to move and take the heat where it is required. Operation and Economy: Fan heaters have a long life and providing fast and effective heating at a low cost. A portable fan heater gives good personal comfort without the need to heat the whole premises, which keeps heating costs to a minimum. 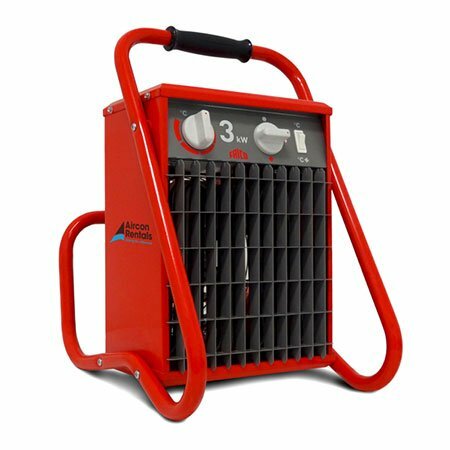 Design: The portable fan heater has a compact and robust sheet steel design with a red finish. The heavy-duty tubular frame acts as a well-balanced and ergonomic carrying handle. The design protects against impact and vibrations and permits use in exacting environments. Very reliable and well protected against impact and vibrations. Corrosion proof housing made of hot zinc-plate and powder enameled steel panels.